(From Netease) Chinese folks have always had the self-entertaining mindset to compare little things to big renowned things even just for the slightest resemblance. We had a post last year talking about a homemade knockoff Lamborghini by a 25 years old guy. 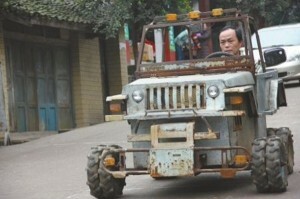 Recently a chef from Zigong City, Sichuan Province became famous on the Internet for spending only about 4000 yuan in designing and handcrafting what netizens called a knockoff “Hummer”.